First up…while discouraged that the breakout hasn’t come yet, I remain tremendously confident that the move I have been anticipating in Eurodollars WILL be, rather, IS happening. We still have over 4 months on our September puts, and with our largest position being the 9850’s, I remind myself that they are only 16 ticks out of the money…which is NOTHING…and I firmly believe we will minimally see those options get 25 to 30 ticks in the money…Truth be known, I now think the Sept 9862 puts at 6 ticks ($181), or the December 9850 puts at 7 ticks ($206), are roaring, screaming buys…I maintain that the economy is HUMMING, that Stocks will continue rising…and interest rates have nowhere to go but higher…and decidedly so…And yes, much, much faster and bigger than the markets are currently indicating. And I know the past 5 months of consolidation have been maddening…and now with this recent drift higher…also costly…But my firm opinion is that we STILL remain in a downtrend, and as I look back over the past year on the chart below, I do note there are any number of occasions when it looked (as it does today with a 4.5 tick rally) like it was reversing to the upside…and was NOT…which is exactly where I think we are right now…meaning, and I know it is a very hard thing to do, that this IS a good place to be buying puts…which I say they are almost “giving away” right now. And just for the record, I STILL think stocks will keep plugging higher…The almost daily freak show in Washington keeps me worried about “derailment”, but I DO think this economy is doing what I have been saying forever…BOOMING…to the extent that whatever happens in DC is almost beside the point. Business is good…ALL OVER THE PLANET…and getting better, and will continue to do so, due to any number of factors that I believe supersede the politically toxic atmosphere we are currently dealing with. and the fact that they all tend to MOVE, a LOT, between now and summer’s end. 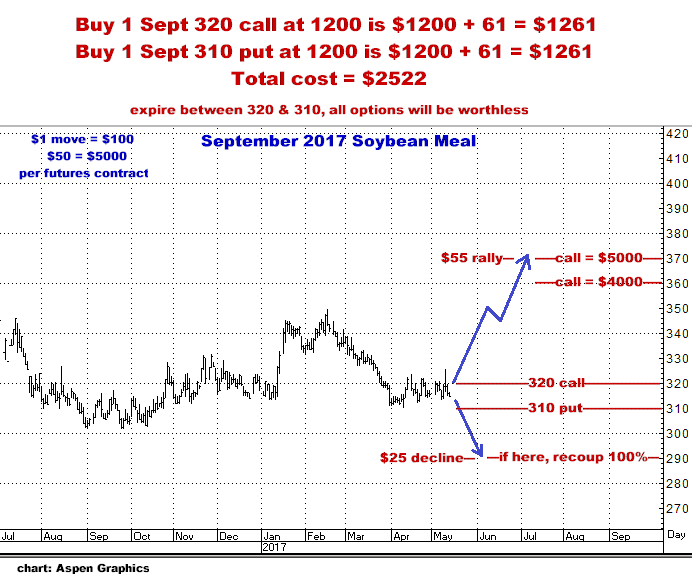 I truly cannot count the times I have seen bearishly regarded “known supply” be blown away by “SURPRSINGLY STRONG DEMAND”, the result being, while everyone is asleep at the wheel, a supposed Bear market turns, virtually overnight, into a roaring BULL…which is what I think we are about to see in Corn, Wheat and Soybeans…And not that it matters at this moment, but I also believe this will NOT just be some 2-3 month rally…I think we are finally ready for an extended multi-year rise in prices. Why buy now? When nobody else is? Then be aware that the conventional “wisdom” among analysts IS overwhelmingly that the world is well supplied in all three…which does lead to end users NOT covering themselves as to future needs…And additionally, does lead to over speculation on the short side. And finally, considering the very high probability, in my opinion, that we WILL see either abnormal weather (too wet, too dry, or both), or even just a “weather scare”, before any of these crops can make it all the way to harvest…? I then can only conclude it makes sense to be buying these markets now…when basically NOTHING in the deck says to do so…and yes, especially now, heading into the growing season, when so much SPEC MONEY is on the other side of this idea. The next question is: How to do it…to which I say, per the 15 charts following (which you definitely should take the time to observe) THERE IS ONLY ONE WAY TO GO…AND THAT IS WITH THE 1 & 1. As can be clearly seen below, all three markets tend to be extremely volatile between now and late August, with the takeaway being that the 1 & 1 approach is the perfect vehicle to use here…from both an offensive and defensive (especially) standpoint. 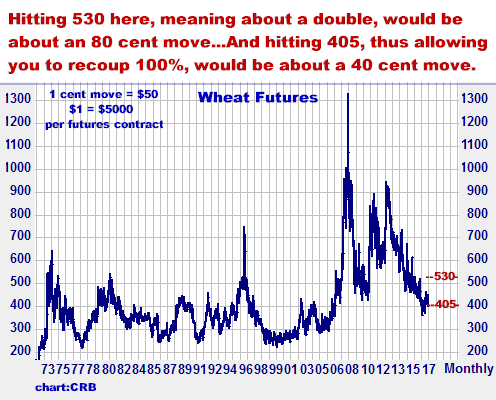 The last 5 years in Wheat…now until September. And the last 5 years in Soybean Meal…now until September. 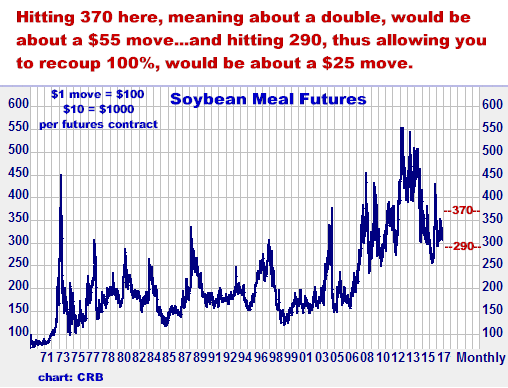 With a $1 move being $5000 per futures contract in Corn and Wheat…and a $100 move in Soybean Meal being $10,000, it should be obvious that there are BIG MONEY moves in every chart up there…with the majority of these contracts swinging hard in BOTH directions. So what it comes down to is this: WHATEVER your opinion…this stuff is ALWAYS more about the numbers than anything else…and I say the very real numbers from these 15 charts argue, without any doubt, for using the 1 & 1. Simply stated, there is not a contract above that DIDN’T make a big move…and if this year is even anything close to the same, a strong move to the downside does give you the opportunity to sell your puts and exit the position without losing (and either walk away, or reposition on the long side)…Or conversely, if they DO go on the upside, even with the puts becoming worthless, there is obviously the potential for sizeable profits…Just as obviously, I also have an obligation to warn you that if these markets all go dead sideways, you could lose every dollar you have invested. You do put on 1 & 1’s in all three markets. BUT HISTORY ARGUES THAT THEY WILL MOVE…A LOT. On the flip side, if they are get started on the upside, the objective is a double…At that point…no matter what…take the money off the table and reassess whether to stay out or reposition again with the 1 & 1. And NONE of the moves I suggest below are what I would consider to be BIG…at all. As I have noted before, more than anything, it IS all about the numbers…And all of the numbers we have here going back for the past 5 years (and beyond really) DO suggest that you DO have a very high probability shot at either not losing…or making at least a double with all three of these positions…No, what has happened in the past very definitely does not mean the same will happen in the future…and if all three of these markets just go dead sideways until September, you could lose every dollar you have invested…but this is very definitely what I DON’T think will happen and is very definitely a bet I am willing to make…and I encourage you to do the same. I absolutely see this as a very smart, very high probability trade, and if you do think the idea makes sense, and do have the risk capital I urge you to go and ahead and make the move…while all three markets are just sitting here…doing little…attracting no attention…Total cost to do all three…which is the way it SHOULD be done…is about $6350. 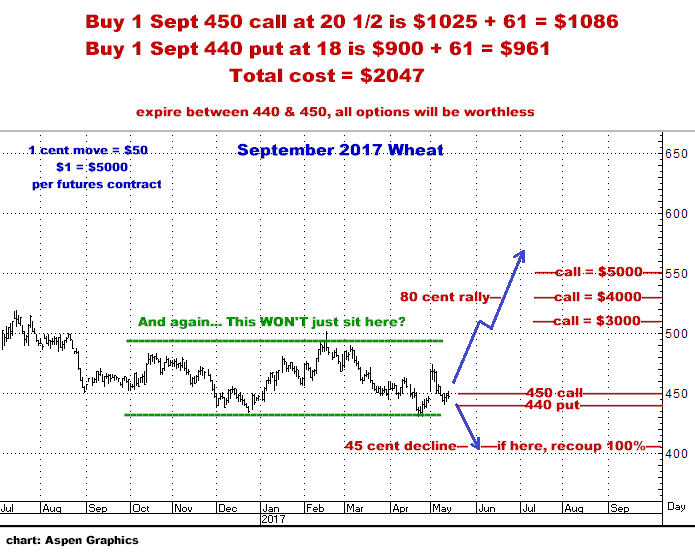 The author of this piece currently trades for his own account and has a financial interest in the following derivative products mentioned within: Eurodollars, Corn, Wheat, Soybean Meal.